A great vacation thanks to Jith’s organisational skills. 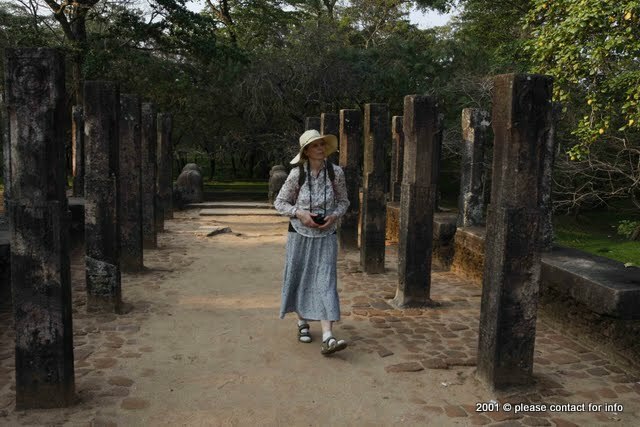 Before the beginning of the trip, having read the “Rough Guide to Sri Lanka” I was concerned about mosquito-borne diseases, the chaotic driving and possible stomach trouble from bacteria in water and food. None of these was an issue at all. There were very few mosquitoes; Mr Silva drove calmly and safely and the speeds anyway are low, and we were given plentiful bottled water to drink/brush our teeth with, so no stomach upsets either. In general, the more rural/isolated the lodge or accommodation is, the better the food. High point was at Mr Martin’s. In retrospect, it was also good not to have stayed in busy Colombo. We were very lucky with the weather- only some very occasional light rains. Olga and I, although 50 years old, are used to hiking and being outdoors. We are not bird watchers so were more interested in experiencing and seeing the nature, ancient sites, and walking/hiking. Jith can explain very well and has broad experience of “Western” (= English, Canadian, Australian) clients. Olga was very impressed at Jith’s knowledge of obscure Russian authors ! Noteworthy too is that Olga woke up very early each day for her yoga !! 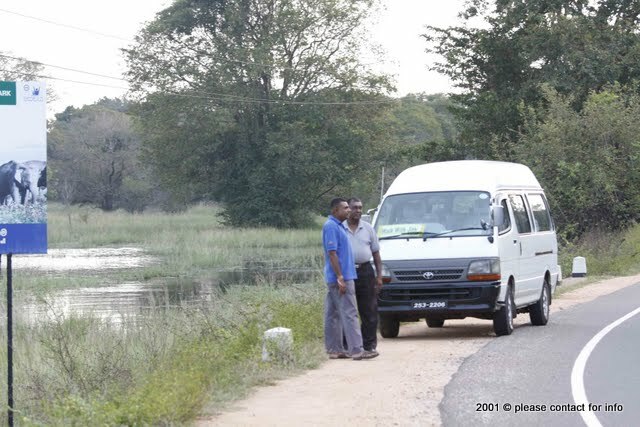 Jith and Mr Silva met us at airport and drove the short distance to Ranweli Holiday Village, Waikkal, a coastal eco-resort, accessible only by a short private ferry ride. Had a simple clean house – walked on the characteristic golden brown/reddish colour beach, Olga looked for shells. Dhows sailing in distance. no one else on the beach. Changed money ($ to rupees) with Jith at a local bank. On the way to Golden temple, Dambulla, we visited an outdoor market in a small town – saw spices/fruit/clay pots. Also saw husks being separated from the coconut, and elsewhere coconut wood being sawn into logs/planks. After a short hike up to the Golden Temple we saw the Buddhist and Hindu caves which contain well preserved frescoes and statues, dating back to the 1st century BC. 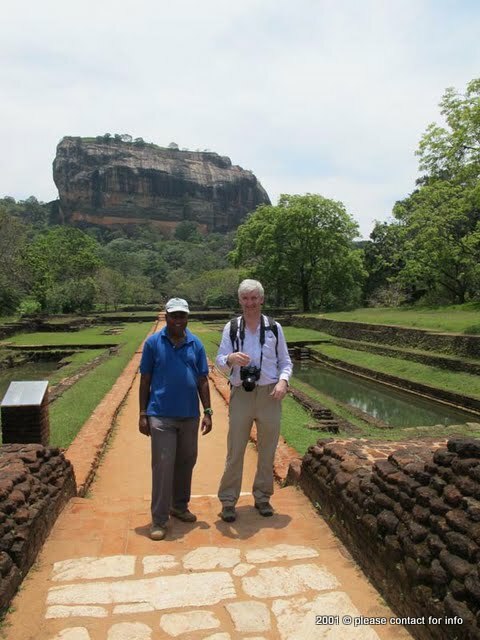 Then to Windsor Park farm estate, Hingurakgoda village (close to Polonnaruwa / Sigiriya areas). Ca. 6 hours drive in total. Accommodation – Windsor Park, Hingurakgoda http://agritourism.cicagri.com/ (3 nights). Windsor Park is set on a 1,500-acre agricultural farm – banana plantations and vegetable gardens, curd made on site. The estate produces rice, fruit, lake fish and dairy. One of the few times I didn’t bring my camera, a praying mantis fell from the ceiling onto our table – a missed opportunity! We were almost the only visitors. We also tried the natural yoghurt, made locally from buffalo milk from the farm shop in its own clay pot. 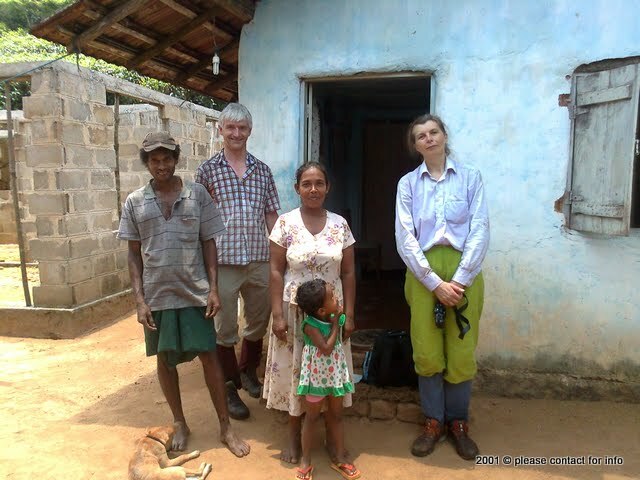 On the way to Sigiriya, Olga, Jith and I walked along a village road looking at village houses, speaking to locals and getting a small insight into village life. 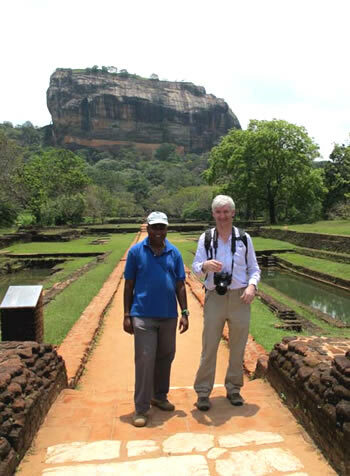 Walked through the gardens and followed the metal ladders to the top of the rock fortress, Sigiriya, the pleasure palace of King Kashyapa in the 5th century AD and past the famous frescoes of the heavenly maidens of Sigiriya. 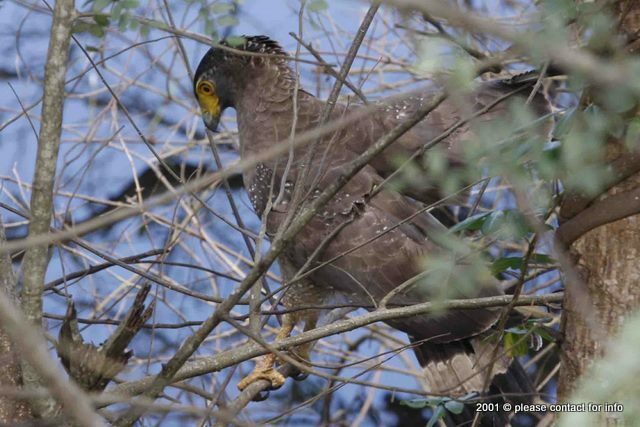 On the way back took photos of a serpent eagle well-spotted by Jith in a tree. To Kandy via a Hindu temple in Matale. Spent an interesting afternoon in the Royal Botanical Garden. In the early evening visited the Tooth Relic Palace, afterwards watched display of Kandyan dancers and drummers, with fire-walking finale. The Hotel Suisse is a classic style colonial hotel with live guitar music and 1980’s songs. Comfortable large room with balcony overlooking the lake. 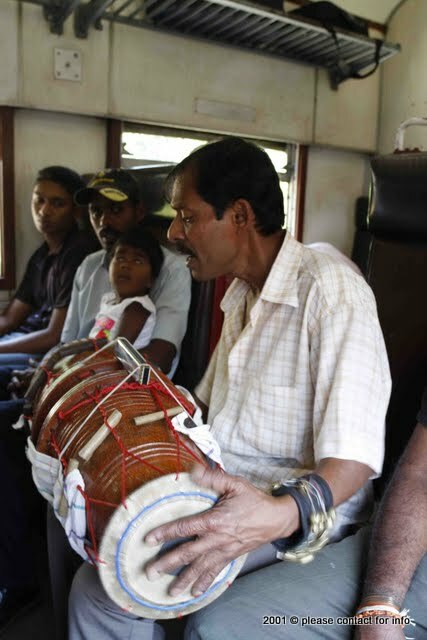 Spectacular train journey from a station about 30 mins drive outside of Kandy to Nanu-Oya. The train winds & climbs through dramatic sceneries of green hills, waterfalls, rivers, deep ravines and green tea plantations. Accommodation –Binota Residency (our “least good” accommodation, but with direct access from bedroom to a balcony with good views of the surroundings and to dry clothes), Nuwara Eliya. (2 nights). Early to Horton Plains park (via Pattipola entrance). 5 hours hike through Horton Plains National Park (in the mountains). Interesting cloud forest and mountain flora. Didn’t spot any leopards or elephants. To Sinharaja rain forest area. Landrover up jeep track from Kudawa Conservation Centre ca. 3 km to Mr Martin’s lodge. 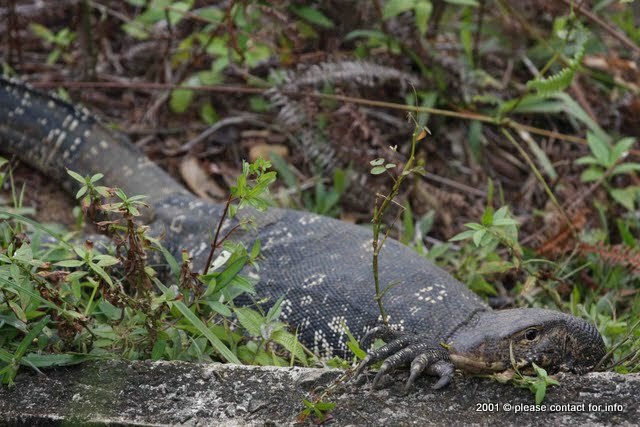 Walked around a little in the evening – saw a basking land monitor. The room was basic but clean and comfortable, the curry was truly excellent ! Nice balcony area to sit at in evening. Jith supplied leach stockings which proved to be essential (unless you’re a local tracker, that is). Memorable walk through a genuine rain forest, also off the beaten track. Jeep down the hill again to Kudawa Conservation Centre. Almost stumbled over a “Mart snake (?) on the road at the very beginning of the walk !. Walked uphill to gate/barrier which marks the beginning of Protected Area – actually this is not so far from Mr Martin’s Lodge. Began along broad (Mulawella ?) trail (saw catfish pool) then turned left uphill along a small path through the rain forest to another point due South. Lots of leaches, so the stockings proved essential (and were effective) . Fortunately, the weather was dry, so it was not muddy or slippery underfoot and streams not swollen. Lot of bird noises in tree tops but these are high above and not visible. Had a fright with a gecko lizard in my sandwich bag at lunch. Descended to a village (drank fresh coconut milk, saw cinnamon being extracted from bark layers) then tuktuk ride to accommodation. If you’re reasonably fit, the hike could have been a little longer. 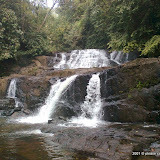 After checking into small eco lodge walked up along river to bathe and saw several waterfalls. Accommodation – Sennaya Eco Lodge (?). Comfortable, first time we had come across beds with mosquito nets. To Galle Ladyhill hotel where we said goodbye to Jith and Mr Silva. Good views from 3rd floor room (52 USD per night). The evening meal at the roof top restaurant can NOT be recommended. Took tuktuk eastwards to a turtle sanctuary. Released 20 baby turtles into ocean. Back to Galle again, lunch at the interesting Royal Dutch Cafe and evening meal (curry and wine) at the posh hotel “Amangalla”. But still not as good as Mr Martin’s ! Hired minibus and driver to take us to Colombo airport. Stopped off on the way at turtle hatchery, at a beach resort, and at Brief Garden, home of Geoffrey Bawa, which was very difficult to find along bumpy roads. A long drive from Galle to airport and hit rush hour traffic at Colombo. Flight to Frankfurt was at midnight.